By and large, the automobiles that have been manufactured in recent years are safer than those built at any previous time in the history of motor vehicles. This improved safety has not explicitly translated to Sport Utility Vehicles (SUVs) and pickup trucks and other light trucks. From the late 1990s onward, SUVs and pickup trucks have experienced a dramatic increase in popularity and became fixtures on American roadways. The manufacturers of these SUVs and pick up trucks have done a poor job in making these vehicles as safe or stable as passenger cars. SUVs and trucks often rollover when the driver is faced with a sudden emergency, tire blowout, tire tread separation or when dodging a road hazard, another car or an animal on the highway. Drivers of SUVs and trucks can also be vulnerable to a loss of control and resulting rollover when their vehicle gets t-boned or hit in a rear-end accident causing a loss in the directional stability of the vehicle. When a rollover occurs the occupants are often faced with more dangers as the roof and roof pillars collapse inward in the passenger compartment, seatbelts can unbuckle or unlatch, airbags failing to deploy and the door locks and door locks and latches opening during a side impact or rollover and allowing the passengers to be ejected onto the roadway. While SUVs are often thought of as the main type of vehicle that rolls over, each year 1000’s of pickup truck rollovers, passenger car rollovers and van rollovers occur, causing severe spinal cord injuries, traumatic brain injury, amputations, paralysis and deaths to thousands of innocent people. If you have been hurt in an SUV rollover accident, it is entirely possible that your crash was beyond your own control and instead may be the caused by an automotive defect, negligent design or other negligence by the vehicle’s manufacturer. Under these circumstances you may be eligible to file a products liability lawsuit seeking financial compensation for your injuries, losses and associated damages. Contact the SUV rollover attorneys of the Willis Law Firm at 800-883-9858 to speak with a skilled and experienced attorney about your potential case. 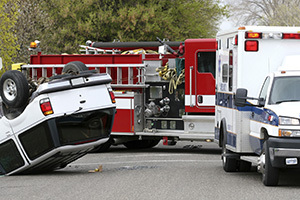 According to studies, SUVs, vans, and light trucks are all more likely to roll over in an accident than passenger cars. According to the National Highway Traffic Safety Administration (NHTSA), SUVs are 75% more likely to be involved in rollover accidents than are traditional passenger cars. Furthermore, NHTSA estimates that the safest SUVs are still more likely to roll over in an accident than the least safe passenger vehicles. We are passionately committed to helping the victims of Truck and SUV rollovers pursue a product liability lawsuit and negligence against the manufacturer and all other negligent parties and obtain the financial compensation that they deserve for the injuries and losses they have suffered. Contact the SUV rollover lawyers of the Willis Law Firm at 800-883-9858 to begin this process today.